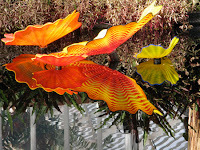 On Friday, a bunch of us went to the Phipps Conservatory in Pittsburgh to see the Dale Chihuly install ation there. It was tremendous. The Phipps has been undergoing a growth spurt with new buildings, new conservatory space and a general upheaval of the physical plant. The windows sparkle. The plants are lush and abundant and are groomed and beautiful. 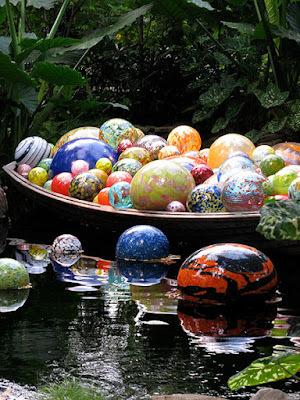 The Chihuly work sings in this environment even more so than that of the Fairchild installation we saw in Miami earlier this year. His floating pieces in the almost black water was sensational and very evocative--making the flowers and plants resound. There was another more floral installation over a black pool that was stunning, with the glass reflecting in the mirrored surface of the water giving it that extra wow. There was a pointy star chandelier hung amongst the pointy palm leaves in a room devoted to cactus that was a beacon for the space but once you were there, allowed the plants to take center stage. 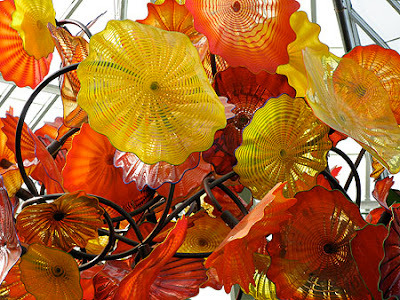 If you havent seen one of these installations, they are great and worth the trip. 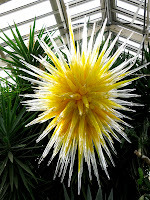 Bless Chihuly for bringing glass and the things glass can do to the thousands of people that wait patiently in line to walk the entire expanse of the institution to see what other treat he has laid down for consumption. He is a master showman who knows what he is doing--and a spellbinder who can encourage the general population to visit a plant installation and LOVE IT. Plus, he has his own merchandise, work, posters, cards and sketchbooks for sale (priced dearly) that the crowd is happy to shell out for. And they got rid of the wierd stuff like the enormous constructions of a zillion chrysanthemums configured to be something seasonal like a floral Santa in a badly constructed plywood, painted sleigh with plywood deer. Or my all time favorite, Humpty Dumpty at Easter. They also had a bunch of "themed" rooms like the Mill or the other, the asian room that were sadly realized and biased about the cultures they were to represent. Disneylike without the humor, style or frankly, the coinage to pull it off. Something they should return, was the man in the front of the Phipps playing the Wulitizer organ the entire time one viewed the flowers and the floral "displays". This ridiculous bouncy, roller rink music was truly the secret sauce that held all the wierdness together. For more pictures, please click to the flick'r album. Couldn't resist.